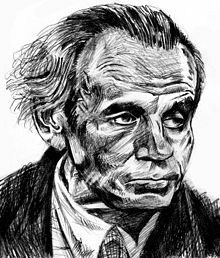 Louis-Ferdinand Céline was a pen name of Louis-Ferdinand Destouches (Courbevoie, 27 May 1894 – Meudon 1 July 1961) was a French writer and physician. Céline was his grandmother's first name. He is thought to be one of the most important writers of the twentieth century. He created a new style of writing that modernized both French and world literature. His most famous work is Journey to the End of the Night. He is a controversial person because of his anti-Semitic pamphlets. This page was last changed on 28 November 2018, at 17:32.